Speaker of Parliament Tan Chuan-Jin, presiding over his first Budget marathon, spoke somewhat wistfully yesterday of his desire to join in the debates. "Some of you think the biggest challenge being up here is how one manages to stay awake or how we answer the call of nature. "Well, that will remain a trade secret," he said, bringing levity to eight days of parliamentary debate filled largely with serious speeches and equally serious questions. "What I find most challenging is having the desire to participate but not being able to do so in a way that all of you do. So, what you all have is a unique, precious privilege to make a significant impact on the well-being of our people." Elected Speaker last September, the former Cabinet minister seemed almost unable to contain himself in the dying minutes of the Parliamentary sitting, declaring with a grin: "Finally, I get to speak! It is my once-a-year occasion." In his 10-minute speech, he gave MPs a pat on the back for their active participation, even as he stressed the need to be pragmatic in the journey towards the nation's ideals and aspirations. Substance and details matter too, not just eloquent, emotive rhetoric, he added, reminding MPs of the words of late deputy prime minister and pioneer leader S. Rajaratnam. Said Mr Tan, quoting the pioneer leader: "What you have done may not get as much publicity as utterances of professional oppositionists, but long after these have gone, what you have done will strengthen the democracy of deeds and not words." Mr Tan also spoke of trade-offs that must be made, along with difficult, unpopular choices. This is especially so when seeking to balance four purposes he distilled from the debates: Making things better for individual Singaporeans and the wider society, plus meeting today's needs while catering for future ones. The key is to be united, he added. Differences are often amplified during debates, but there are more points of convergence and agreement than not, he observed. He cited the move taken for the vote on the Budget, in which members voted not by saying "aye", but electronically at their individual seats. All Workers' Party MPs present voted against Budget 2018. They had said they could not support the future rise in the goods and services tax without more information. Mr Tan said: "Argue, fight by all means, but within limits and in a responsible manner. I am thankful that despite it all, we do have a unity of thought and conviction on where we should go and how we should position ourselves as a nation." He also took an unusual path, to the amusement of MPs, when he joined what he called an "arms race", linguistically speaking. He gave a quick translation in Mandarin of "set-top box" and "analogue TV" which an MP had spoken on. After noting Senior Minister of State Chee Hong Tat spoke twice in Tamil, Mr Tan then slipped into Tamil, saying: "This is a multi-lingual Parliament. I can also speak in Tamil." The House rocked with laughter. Like Leader of the House Grace Fu, Mr Tan stressed the need to build a caring society. Going the extra mile for each other will "make us great as a nation", he said. "This is about the heart and soul of our nation... Unlike everything in the Budget, these cannot be mandated by law, but they can be nurtured. And it is for us as Singaporeans to respond." Workers' Party (WP) chairman Sylvia Lim has said she accepts that her suspicions that the Government had backtracked on the timing of the goods and services tax (GST) hike "may have been wrong" after she has reviewed the records. But she refused to withdraw and apologise for her comment last week, saying she was doing her "duty as an MP to convey ground concerns, reactions and confusion". This was despite repeated calls from People's Action Party ministers - who said Ms Lim's comments had damaged the reputations of government leaders - for her to do so. Ms Lim said yesterday: "I did not accuse the Government of being untruthful as alleged, and neither had I intended to accuse the Government of dishonesty. "I do not accept the over-characterisation the PAP MPs have put on my words and intentions based on their own interpretation borne out of overactive imaginations and oversensitivity." She noted that she had raised her suspicion in the heat of the exchanges at the Budget round-up, adding: "Since the Government has now refuted it had any intention to raise GST immediately, I can accept that my suspicion then may not have been correct." On Thursday last week, Ms Lim said she suspected the Government had intended to raise the GST immediately but backtracked after adverse public reaction. Finance Minister Heng Swee Keat announced last month that the GST will go up from 7 per cent to 9 per cent some time between 2021 and 2025. In response, Leader of the House Grace Fu said yesterday that Ms Lim's comment suggested that the Government had "said one thing in public but (was) planning secretly to do another". This, she added, tarnished the reputations of Prime Minister Lee Hsien Loong, Deputy Prime Minister Tharman Shanmugaratnam and Mr Heng, who have said over the years that tax revenues need to be raised in the long run. Noting that the parliamentary privileges that MPs enjoyed came with a responsibility to check the facts and basis of their statements, she said of Ms Lim's comments: "It reflects the low standards which the member and her party have set for themselves with regard to commitment to truthful and honest debate in Parliament." "We are deeply disappointed that someone of her experience should accuse the Government of lack of candour, even though the facts have been explained to her clearly." The minister, who is in charge of procedure and order in Parliament, added that if Ms Lim repeats such "dishonourable conduct and abuse of parliamentary privilege", the matter will be referred to Parliament's Committee of Privileges. It can mete out penalties to MPs, including fines and jail terms. Earlier, Ms Lim explained how she arrived at her suspicion. She cited news reports and economists who had predicted that the GST rate would be raised this year or the next. The public was also worried about an imminent hike, she said. She also said that the Government "contributed to this suspicion by its non-denial of reports and economists' predictions of an immediate GST rise". Ms Lim also cited PM Lee's statement in last year's debate over Oxley Road, during which he told MPs: "If you think something is wrong, even if you are not fully sure, then come to this House, confront the Government, ask for explanations and answers." She queried: "Is there a difference in standards here - when the PM's name needs to be cleared and when we are talking about raising taxes on the people?" Ms Fu said that there is nothing wrong in MPs representing their constituents by surfacing their views. But they must check the facts before they "bring the opinions, the speculations, the views, the unhappiness to this Chamber", she said, noting that Ms Lim had admitted to not taking this step. The exchange, which lasted 22 minutes, also saw Mr Heng weighing in. He said that the Government could not have made any earlier announcements on the GST hike, explaining: "We take great care in preparing the Budget and the details are kept secret until the day of the Budget, because it has an impact on the market, and not just in Singapore, but internationally." To this, Ms Lim said that she could not say for sure what the position was as "only the Cabinet knows the truth of the GST hike". Stepping into the exchange, WP chief Low Thia Khiang said that the Government could have said earlier that it had no intention to raise the GST at this Budget, "and that would have cleared the air and the confusion on the ground". "Now, it is clear that the Government has no intention to raise GST at that point in time and her suspicion wasn't really correct at that point in time." Mr Heng said he could accept that Ms Lim could have said things that she did not intend in the heat of the exchange. But now, would she accept that there was no backtracking by the Government? To this, Ms Lim repeated her position that while she accepted she might have been wrong in her suspicion, she saw no reason to apologise. The views, ideas and worries of Singapore's youth will take centre stage in a series of dialogues to be launched next month. Much like the Our Singapore Conversation series of a few years ago, the new Youth Conversations aim to inform the young about important national issues, as well as help them work out their differences by listening, negotiating and finding solutions together, and with the Government. Minister for Culture, Community and Youth Grace Fu, in announcing the initiative, said it will be different in two ways from previous efforts to engage youth. First, the Government will be more open. "We will be sharing more policy thoughts and considerations with our youth," she said. "We will listen more to understand our youth's views, concerns and aspirations. We will provide more support for our youth in generating and implementing their ideas." Second, there will be new ways for youth to get their voices heard. "We are experimenting with different and novel modes of engagement," said Ms Fu. "Participants can expect the conversations to be candid and interactive. The conversations should broaden their horizons," she noted. "This will be a platform where youth meet not just like-minded peers, but also make new friends who may come from different backgrounds, and hold different beliefs and perspectives." She added that new methods such as hackathons, or mass hacking events, and citizen juries will be used to engage them. A new online platform is also in the works, Ms Fu said, without giving details. Later, Senior Minister of State Sim Ann and Parliamentary Secretary Baey Yam Keng told the House that youth leaders will get first-hand experience through their attachments with social service organisations. They will also get to meet their peers from Asean countries under an Asean Youth Fellowship Programme. Ms Fu, in a wide-ranging speech that covered community, sports, heritage and youth issues, noted that globalisation and other forces are pulling societies apart. Singapore, too, faces the challenge of strengthening its social fabric in the light of such forces. Her ministry will focus on three areas this year: Encourage Singaporeans to care for one another, promote greater social cohesion and build a confident nation through arts and heritage programmes. Hence, it will launch Our SG Heritage Plan, a long-term national drive to preserve and promote Singapore's heritage. Also, it will expand the scale of its programmes to encourage racial and religious harmony, using social media to get more people to join dialogues on sensitive topics such as race and religion. In the area of sports, a new sports centre in Sembawang will be ready in the next few years, while older centres such as those in Delta and Choa Chu Kang will be rejuvenated. Four new Active Health Labs will be set up in Sengkang, Woodlands, Bishan and Jurong, while two mobile ones will go to community clubs and Housing Board residents' centres.These labs will help Singaporeans assess their fitness levels and maintain active lifestyles. The debate on the ministry's budget wrapped up the annual Budget marathon, which lasted eight days this year. Malaysia has Mak Yong theatre from the villages of Kelantan; Indonesia has Indonesian batik, the art of boat building in South Sulawesi and three genres of traditional dance in Bali, among others. The question of what would be Singapore's first item on UNESCO's Intangible Cultural Heritage (ICH) Representative List is now under consideration, Ms Grace Fu, Minister for Culture, Community and Youth, revealed during the debate on her ministry's budget. The list was started in 2008 following UNESCO's Convention for the Safeguarding of the Intangible Cultural Heritage, which aims to raise awareness about the importance of such heritage items and ensure their protection. Ms Fu announced yesterday that Singapore ratified this convention last month, committing to safeguard its cultural heritage. She added that Singapore is working to identify its first item on the UNESCO list. In a National Heritage Board (NHB) poll this year, some respondents suggested Singapore hawker food such as rojak, bak kut teh, dosai or char kway teow, when asked what ICH was significant to them. Food resonated most strongly with the more than 3,000 respondents. Ms Fu said: "In the coming months, we will continue our conversations with the community to uncover the intangibles that resonate with Singaporeans." NHB chief executive Chang Hwee Nee said the potential listing is part of the board's hope "to share our multicultural aspects of our heritage with the international community, and contribute to the diverse cultures of the world". There has been controversy from time to time over the listing of ICH items. But an item's listing does not imply it belongs, originates from or exists only in the submitting country. The bid to have a Singapore item on the ICH list comes as Singaporeans pay more attention to the island's history and heritage, and follows the successful listing of the Botanic Gardens as a UNESCO World Heritage Site in 2015 during SG50. Mr Victor Yue, honorary treasurer of the Singapore Heritage Society, said: "While food is important because we are a foodie nation, there are also other art forms and interesting localised religious rituals worthy of being documented and even listed." For example, some dialect-run Catholic churches in Singapore have their own interpretations of wakes and funeral rituals, he added. The Republic is drawing up a comprehensive blueprint for the heritage sector, which would include an inventory for its intangible cultural heritage, in partnership with local communities, academics and experts. Some $66 million has been set aside to implement this plan. The ICH inventory will be released in batches over the next few months. It is unclear when an ICH of Singapore will officially be listed with UNESCO, although some observers speculate that the inscription could take place next year - the year of Singapore's bicentennial. Ms Fu said changes will be made to the relevant legislation in the next two years to better support the preservation of tangible and intangible heritage here, and safeguard Singapore's archaeological history more effectively. As a statutory board, the People's Association (PA) supports the elected government of the day in implementing its policies and programmes, including explaining difficult and sometimes unpopular policies, said Minister in the Prime Minister's Office Chan Chun Sing yesterday. "We do not presume that opposition MPs believe that they would be willing or able to execute this role for the government of the day," he added, explaining why all grassroots advisers are People's Action Party (PAP) MPs or candidates. But he stressed that government agencies, including grassroots organisations under the PA, would work with both grassroots advisers and opposition MPs "on matters related to their respective roles". Mr Chan, deputy chairman of PA, was responding to Workers' Party (WP) MPs Pritam Singh and Faisal Manap, both from Aljunied GRC, who raised concerns about politicisation of the grassroots due to its links with the ruling party. During the debate on the budget of the Ministry of Culture, Community and Youth, Mr Chan said grassroots advisers are appointed by the Government to guide grassroots organs in promoting social cohesion and racial harmony, and connecting the people and the Government. Among their tasks would be to explain policies, such as the planned hike in goods and services tax (GST), which the WP is against. Citing this, Mr Chan said asking WP MPs to work with the Ministry of Finance to explain the GST hike would "put you in a very difficult position. So we perfectly understand that. So where it's appropriate, the agencies will work to serve the community". Mr Faisal asked if opposition wards can have grassroots advisers who are not linked to the PAP, such as retired public servants. He said it was "not right" for a PAP candidate to take on the role, as the Meet-the-People Sessions would be held at the PAP branch, and appeal letters would also bear the party letterhead. To this, Mr Chan said residents in opposition wards are told that they should first approach their MP. But if they still want to seek help from the PAP branch, the grassroots adviser can help them draft, sign off and send letters. Even then, said Mr Chan, "I'm sure the agencies will know who is the elected MP in that constituency". Mr Singh asked if community development councils (CDCs), which come under the PA, would work with opposition town councils. In response, Mr Chan said government agencies "will not do and conduct any activities with any political party for political outreach". "The government of the day must be very careful that whenever it spends its money, whenever it does its outreach, it does not overstep its bounds to the political realm. We keep these two functions very separate," he said. However, Mr Singh said he had seen banners put up in celebration of particular festivals which carried both the logos of a CDC and a town council, adding that this was not considered political activity. Mr Chan, noting that government agencies have worked with opposition town councils in the past, said Mr Singh should approach the respective CDCs. Asked by WP chief Low Thia Khiang about whether PA activities are considered political outreach, Mr Chan said there is a distinction between "political outreach" and "political impact". "All government statutory bodies, when we execute our duties, will be serving the government of the day," he said. "Then you ask, when the statutory boards and the government agencies do their work properly and do their work well, does it have a political impact? The answer is obvious." The Health Ministry will loosen restrictions on Medisave use and build polyclinics in more neighbourhoods as part of efforts to keep healthcare close to the homes of Singaporeans. It is also topping up funds for community support schemes and creating more avenues for healthcare professionals to work in the community care sector. These announcements in Parliament yesterday flesh out the ministry's push to focus on preventive care, as well as the primary and community care sectors. Health Minister Gan Kim Yong said there will be at least 30 polyclinics by 2030, an increase from the current 20. 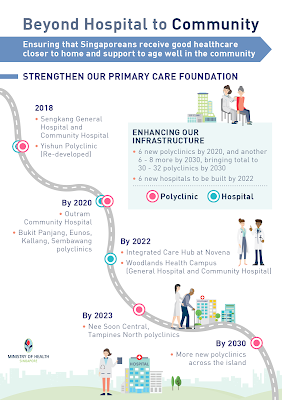 Elaborating, Senior Minister of State for Health Lam Pin Min said four will be opened in Eunos, Kallang, Sembawang and Bukit Panjang in two years. 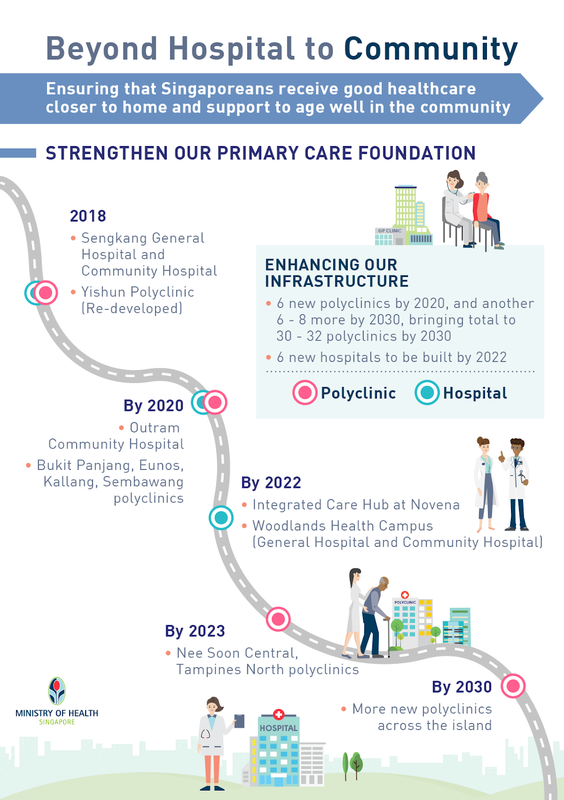 He added that another two polyclinics will open in Nee Soon Central and Tampines North by 2023, with four to six more planned in the west and central parts of Singapore. "The cornerstone of a sustainable healthcare system is strong primary care, where patients with chronic conditions are managed well in the community, with better health outcomes," Dr Lam said. The Medisave announcement was made by Senior Minister of State for Health Chee Hong Tat. He said the annual Medisave withdrawal limit for chronic medical conditions, vaccinations and health screenings will be raised from $400 to $500. Also, the age limit for Flexi-Medisave - a scheme to help seniors offset the costs of outpatient treatment - will be lowered from 65 to 60. This is expected to benefit 260,000 Singaporeans aged between 60 and 64, he added. Both changes will take effect from June, he added during the debate on the ministry's budget. Mr Gan and Mr Chee were replying to several MPs' questions on the ageing population, including how senior care infrastructure and manpower will be adapted for the elderly to age in place without having to be admitted to a hospital or nursing home. Dr Lily Neo (Jalan Besar GRC) welcomed the decision to bring healthcare and social support for seniors under the ministry's umbrella, but cautioned that the operational details will require much work. "Daily meals and activity programmes must be provided with an aim in mind - to assist seniors to remain in the community and ward off frailty, diseases and immobility," she said. "Is MOH poised to train present and future personnel to provide these aged care services?" Replying, Senior Minister of State Amy Khor said existing services will be expanded to help seniors age in familiar surroundings. These include more subsidies for transport to subsidised eldercare and dialysis centres, and expanding these subsidies to medical supplies needed for home palliative care. It will place nurses and pharmacists in the community so that medical help is within easy reach. The ministry is also looking at "housing plus" models that combine housing with care, similar to assisted living facilities overseas. Dr Khor said: "Our models of care will need to evolve, as there is no one-size-fits-all option for seniors." 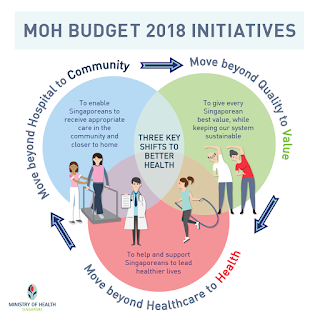 This year, the Ministry of Health (MOH) will spend a big chunk of its budget on beefing up community care schemes, investing in manpower and infrastructure, and topping up funds that help seniors stay independent well into their twilight years. These measures encapsulate the ministry's "Three Beyonds" strategy, which aims to shift the focus from just providing healthcare to ensuring quality of life. The strategy was first mentioned by Health Minister Gan Kim Yong in last year's Budget debate. It refers to going beyond the hospital to the community, shifting the focus from quality to value, and moving from healthcare to health. Giving an update on the strategy in Parliament yesterday, Mr Gan said that spending in the intermediate and long-term care sector has nearly quadrupled in the past decade. This sector encompasses nursing homes, senior rehabilitation and daycare services, as well as home care. Spending in this sector stood at $1.3 billion between 2007 and 2011, but jumped to $5.1 billion between 2012 and 2016. Between 2010 and 2015, overall national health expenditure rose from $10.9 billion to $18.9 billion. "These investments reflect our priority to anchor care firmly in the community," said Mr Gan. "As we continue to invest in community care, we also need to bring social and healthcare services closer to better serve our people." Opening yesterday's debate on the ministry's budget, Dr Chia Shi-Lu (Tanjong Pagar GRC), who chairs the Government Parliamentary Committee for Health, said: "Perhaps it should not be so much about moving beyond one or the other, but about embracing and ensuring that Singaporeans can enjoy health services that are of good quality and good value." Mr Gan also spoke of the need to reorganise the public healthcare system beyond what has been done in the past year to create "synergy and deliver better care". 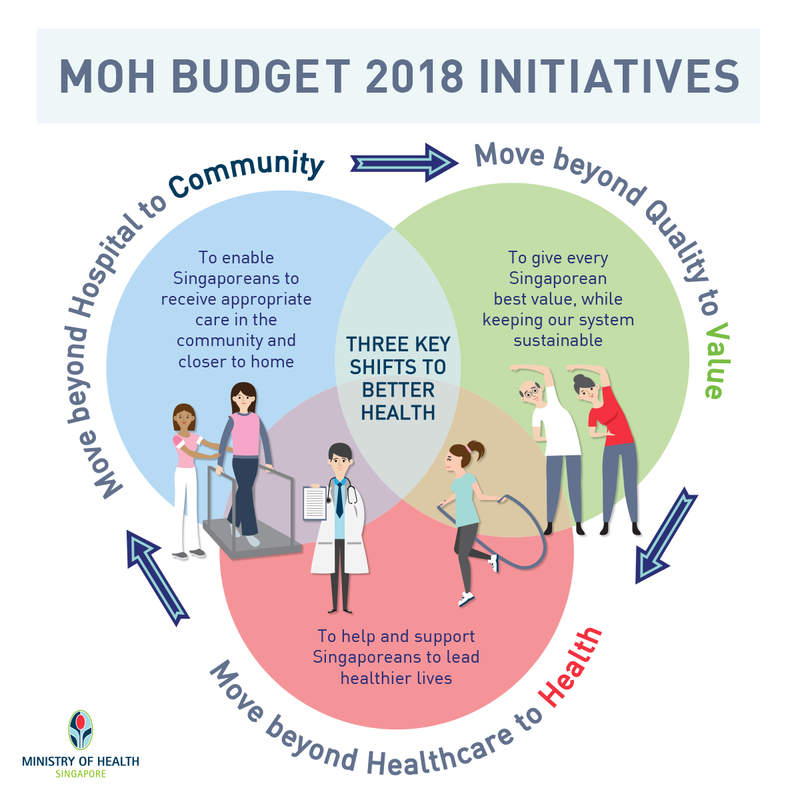 Last year, MOH announced that the six public healthcare clusters would be streamlined into three. Now, it is also setting up a new national supply chain agency for healthcare that will be in charge of procurement and resources across all three clusters. "(This will) achieve economies of scale, create greater synergy, develop new capabilities and evolve innovative supply chain solutions," Mr Gan said. 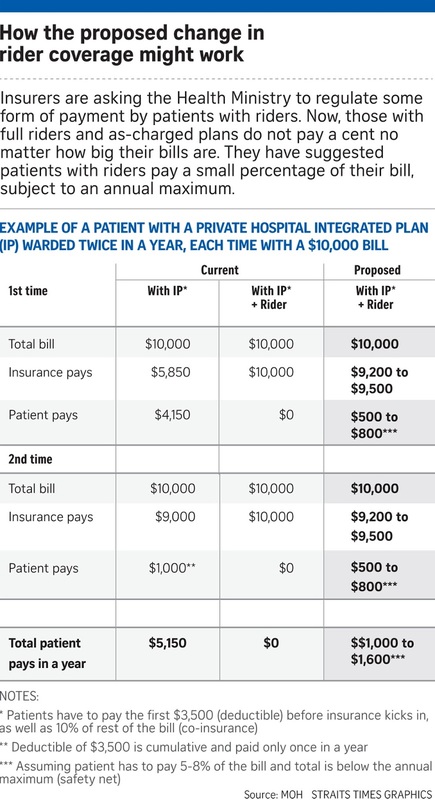 "This will also help to mitigate cost increases and bring greater convenience to patients." On top of that, the ministry's Office of Healthcare Transformation will look to experiment with "game-changing ideas", he added. For starters, it will work with the National University Health System to test the ideas at a "health empowering campus" in Alexandra Hospital in the second half of this year. The war against diabetes is moving up a gear, with more leeway for diabetics and those at risk of the disease to use their Medisave, and an added $15 million to be pumped into developing low-sugar foods and drinks. A workgroup will also be set up to reduce the high ratio of leg and toe amputations among diabetics in Singapore - thrice the average of Organisation for Economic Cooperation and Development (OECD) countries. Singapore has one of the world's highest rates of such amputations, with 180 operations for every 100,000 adult diabetics in 2015. The workgroup will recommend guidelines for diabetic foot care, among other things. "About three in four Singapore residents aged 65 and above are affected by diabetes, high cholesterol or hypertension, or a combination of the three," said Health Minister Gan Kim Yong in the debate on his ministry's budget yesterday. "If nothing is done, diabetes is projected to affect more than one million Singaporeans by 2050," he warned. During the debate, Senior Minister of State for Health Chee Hong Tat announced schemes to help diabetic patients and those at risk of the disease. From June, diabetic patients will be able to use Medisave for diabetes-related items such as lancets and test strips, while those with pre-diabetes can tap it for medical consultations. To get people to eat healthily when dining out, the development of locally produced low-sugar foods and drinks will also get a boost. A $15 million grant will be added to the Health Promotion Board's Healthier Ingredients Development Scheme, on top of the $20 million grant introduced in July last year. The Health Ministry is stepping up efforts to attract local manpower to the healthcare sector, including those with no experience but might be thinking of make a career switch. It is also developing a more in-depth training programme for nurses, with part-time "stackable" courses that can add up to higher qualifications and allow nurses to study while working. 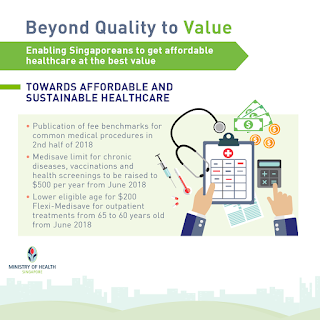 "Our approach... must be to equip our healthcare workforce with future skills to give better care, achieve higher productivity and grow a strong local core," said Senior Minister of State for Health Amy Khor in Parliament yesterday. Ms Joan Pereira (Tanjong Pagar GRC) and Nominated MP K. Thanaletchimi both asked about manpower shortages in the sector, especially with Singapore's growing healthcare needs. Dr Khor said most public sector healthcare professionals who turn 62 are re-employed, and the ministry will do more to hire seniors without healthcare experience. She added that the total intake of medical students has risen by 40 per cent in the past five years, while that of nursing students, by 30 per cent. Dr Khor also outlined new schemes to attract more people. For example, the National University of Singapore will launch a part-time graduate diploma in community health nursing later this year. Next month, the Institute of Technical Education will roll out a Work-Learn Technical Diploma in rehabilitation care. "Given the twin challenges of rising demand for healthcare and slowing local labour force growth, we need to ensure sustainability of the healthcare workforce over the long term," she said. Commuters riding on the Bukit Panjang LRT (BPLRT) can expect more reliable rides from 2022, when the majority of works to overhaul the problematic line is completed. The Government yesterday gave details of the $344 million renewal project for the 19-year-old system that it has awarded to the original supplier, Bombardier. "The BPLRT... is reaching the end of its useful life," Transport Minister Khaw Boon Wan said during the debate on his ministry's budget. Since it opened in 1999, the 14-station BPLRT has been dogged by reliability issues, owing to how its design comprises sharp turns over undulating terrain. Last year, BPLRT trains travelled an average of 53,000km before encountering a delay of more than five minutes, which pales in comparison to the Sengkang and Punggol LRT's reliability of 115,000km before a delay. The renewal project, which will start in the first half of this year, will cover the upgrade of the line's existing signalling system to a more precise communications-based train control (CBTC) system that has better control of train speeds. The new system will also have more redundancy, meaning that in the event of faults, the system will have back-ups to keep trains running. The power rail along the entire 7.8km-long BPLRT will be replaced and more robust power rail brackets will be installed. The 19 trains that have been in service since the BPLRT was launched in 1999 will be replaced with new ones, which will have better propulsion motors, eco-friendly LED lights and better air-conditioning systems. Thirteen trains, which have been in service since 2015, will be upgraded. The Land Transport Authority (LTA) said the new CBTC system, trains and power rail system will also be equipped with condition monitoring features to oversee the life-cycle of the systems, so predictive maintenance can be scheduled. The new signalling system and new trains will be fully rolled out by 2022. Other works, such as the replacement of the power rail and decommissioning of the old signalling system's track circuits, should be completed by 2024. LTA said that while most of the works will be completed during off-service hours, where required, operating hours will be shortened to provide engineers with more time. To create additional space for the upgrading works, Ten Mile Junction station will be permanently closed from the fourth quarter of this year. LTA's deputy chief executive for infrastructure and development, Mr Chua Chong Kheng, said that Bombardier's proposal met the authority's specifications, as it does not require any modification to existing rail infrastructure and involves minimal disruption to services and commuters. Bombardier is also "familiar with the current system", said LTA, and has been involved in ongoing reliability work carried out since 2016. The manufacturer will provide a new service support arrangement in which BPLRT operator SMRT will engage Bombardier via a long-term maintenance contract for spares, training and technical expertise. Mr Liang Eng Hwa (Holland-Bukit Timah GRC), who is also the grassroots adviser to the Zhenghua ward, said: "We should also build up home-bred BPLRT maintenance expertise as we renew the system so that we can be more self-sufficient going forward." Commuters should see public transport service standards rising in the coming years as the Government continues to invest in buses and trains. But they can expect fares to creep up as well. During a debate on his ministry's budget yesterday, Transport Minister Khaw Boon Wan said: "The investments we are making to improve the transport system are huge." He pointed out that his ministry's budget is now the second largest among ministries, after the Defence Ministry, and ahead of the Health, National Development and Education ministries. "Over the next five years, we will provide subsidies of about $5 billion for public bus services and $4 billion to renew our rail operating assets," Mr Khaw said. "Another $20 billion will be invested in infrastructure to further expand the public transport network." As a result of these investments, service standards will improve. For instance, the bus contracting model had already resulted in additional capacity for more than 100 bus services. Mr Khaw also noted that rail reliability has improved significantly, with the North-South MRT line - Singapore's oldest - clocking more than 600,000km before a fault occurs, for January and February this year. This is nearly double the standard the line - which has just had its signalling system upgraded - achieved last year. According to the minister, these improvements to public transport services have increased operating costs by about 60 per cent. This cost increase has been borne by the Government, but Mr Khaw indicated that commuters are likely to have to share the inflated expenditure eventually. "Our transport fares are affordable," he said, adding that the Government measures affordability by tracking the percentage of income which lower-income Singaporeans spend on public transport. "While transport fares must be affordable, we must be careful that they are not priced too cheaply, as maintaining a high quality transport system requires resources," he noted. "Cheap fares are popular, but they are not sustainable." Mr Khaw said he agreed with Ms Cheng Li Hui (Tampines GRC), who asserted that fare adjustments had lagged rise in operating costs. "I agree with Ms Cheng Li Hui that the current formula is inadequate," he said. 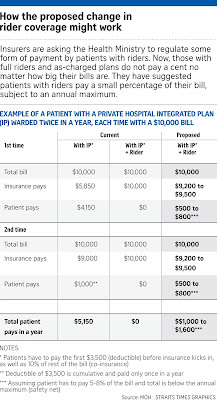 "It can be improved to better track total costs." The minister said the Public Transport Council is currently reviewing the fare formula. "I am confident that they can work out a fair and sustainable arrangement," he added. Mr Sitoh Yih Pin, chairman of the Government Parliamentary Committee for Transport, asked the minister how long high expenditure for Singapore's transport system would last. He pointed out that the Transport Ministry's budget this year had increased by more than half, from $9 billion last year to $13.7 billion this year. Mr Khaw said much of the increase was attributable to capital expenditure on new projects such as Changi Airport Terminal 5, which "may take more than a decade" to complete. New MRT projects "are also multi-year projects", he added. "So, it imposes a heavy responsibility on us to make sure that we spend every single dollar very carefully, and at the same time be on the lookout for ways and means to save money." All travellers, whether they take short or long-haul flights, use the same facilities at Changi Airport and should pay the same departure fees, said Second Minister for Transport Ng Chee Meng. "It is only fair," said Mr Ng, who was responding to a suggestion by Mr Zaqy Mohamad (Chua Chu Kang GRC) on Tuesday for long-haul travellers to pay a higher rate. This is to ensure that Singapore does not lose its competitive edge as a regional hub, said Mr Zaqy who raised the matter following an announcement last week that from July 1, all travellers will have to pay $13.30 more when flying out of Changi Airport. The extra - on top of $34 which travellers now pay - is to help fund the development of Changi East, a massive expansion masterplan which includes the construction of Terminal 5 (T5). Mr Ng said that the Government had considered a tiered pricing system, but decided against it and was using the same principle that guides current charges at Changi Airport. Speaking in Parliament yesterday during the debate on the Transport Ministry's budget, Mr Ng also addressed Mr Zaqy's point that while airports in Hong Kong, Dubai and Qatar are also collecting from users to fund future expansion, South Korea's Incheon airport is not doing so. Mr Ng pointed out that while the Incheon airport expansion added extra capacity of 18 million passengers a year - about the size of T4 - the Changi East project is tantamount to building a brand new airport development. Slated to be completed around 2030, T5 will eventually be able to handle up to 70 million passengers a year, which is more than T1, T2 and T3 combined. On the need to impose user charges ahead of T5's completion - something that airlines and some travellers have objected to - Mr Ng pointed out that airport users will benefit even before the new terminal opens. A third runway being built as part of the Changi East project will allow the airport to handle a growing number of flights when all three runways are operational in the early 2020s, almost 10 years before T5 opens. "Having users start paying earlier also avoids having large spikes in the amount they must pay later on," said Mr Ng. He added that the Government will bear a significant portion of the Changi East development costs, expected to run into tens of billions, while Changi Airport Group will also commit significant resources. Mr Ng did not reveal the total projected cost for the expansion, a question Mr Zaqy had raised. The minister, however, reiterated that with the demand for air travel in the Asia-Pacific expected to grow strongly in the coming decades and with the aviation sector a cornerstone of the economy, Changi's expansion is much needed. 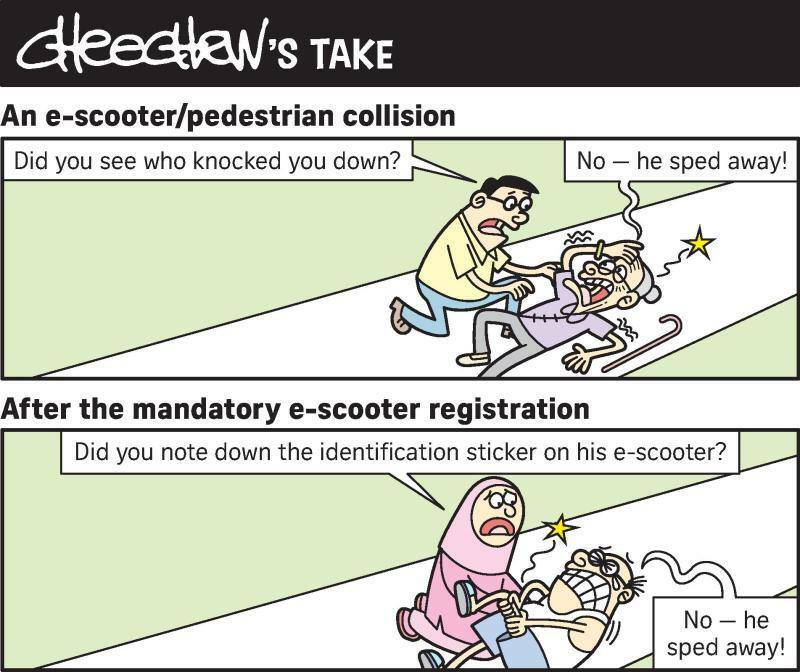 E-scooter users will have to register their devices from the second half of this year as the Government tries to rein in reckless riders. Senior Minister of State for Transport Lam Pin Min said in Parliament yesterday that the Government had accepted the Active Mobility Advisory Panel's proposal last month to make such registration mandatory. The panel was formed in 2015 to develop a set of rules governing the use of footpaths and cycling paths by cyclists and users of personal mobility devices (PMDs). 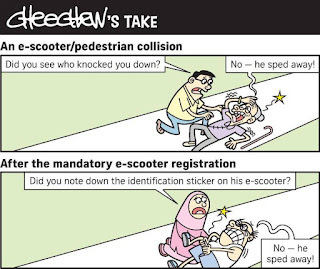 "Registering e-scooters will help deter reckless behaviour, accord more responsibility to the users and facilitate enforcement officers in tracking down errant users," Dr Lam said during the debate on his ministry's budget. He added that the process of registration will be kept "as simple and low-cost as possible". As part of the registration process, users will have to provide their personal particulars as well as paste identification stickers prominently on their devices, and ensure that these meet requirements such as a maximum weight of 20kg and a top speed of no more than 25kmh. But other PMDs such as hoverboards will not require registration as they have lower speeds and their usage is less widespread, said the Land Transport Authority (LTA). Several MPs had raised the issue of reckless riding of PMDs, with Mr Ang Wei Neng (Jurong GRC) saying the toes of one of his residents had been fractured by an e-scooter food delivery rider at the Chinese Garden. There were 110 accidents involving e-scooters in the first nine months of last year. Of these, about 30 took place on public paths and involved collisions between pedestrians and PMD users, while the rest took place at road junctions and on roads when users were riding illegally alongside vehicular traffic. Responding to Mr Zaqy Mohamad (Chua Chu Kang GRC), who raised the issue of whether the speed limit for PMDs needs to be revised, Dr Lam said the panel will look into the issue as well as matters such as the need for an insurance and compensation framework. "The panel will look into these issues, weighing the need for these initiatives against the impact on the large majority of responsible users, and taking into account the practices of other jurisdictions," he said, adding that its recommendations will be published at year end. The LTA said more details regarding the registration will be provided at a later date. The move to register e-scooters comes after a similar initiative was introduced for e-bikes last August, aimed at enhancing enforcement against reckless riding and the use of non-compliant devices. As of January, more than 13,000 e-bikes have been registered with the LTA. Mr Arif Abdul Hamid, 45, who heads e-scooter enthusiast group Singapore Inokim Riders, said mandatory registration could help ease concerns about errant riders, but was uncertain if it will stamp out reckless riding. "There are too many e-scooters and not enough enforcement officers," he said. Social service professionals have reason to cheer - their salaries are set to increase. From April 1, the Ministry of Social and Family Development (MSF) will raise the salary guidelines for staff working in MSF-funded programmes by up to 12 per cent from its last financial year. This covers employees from social workers to therapists and executives, across varying seniority levels. They are not hired by MSF but by social service organisations, such as family service centres, which run programmes funded by the ministry. "Many of those who work in the social service sector do not do it for the remuneration. They see it as a calling. Nonetheless, they deserve to receive a fair and competitive wage and have their contributions recognised," said Minister for Social and Family Development Desmond Lee in Parliament yesterday. The MSF and the National Council of Social Service (NCSS) review the salary guidelines every three years to ensure that wages in the social service sector remain competitive. The sector had about 15,000 workers at the end of last year and will need about 1,000 more by next year. NCSS will release details of the new salary guidelines later this month. But Mr Lee hinted at what is to come: A special needs teacher with five to 10 years of experience, for instance, can expect a pay rise of about 8 per cent. While the pay guidelines are not compulsory, charities interviewed say they follow them in order to attract and retain staff. About three in four employees working in groups running MSF-funded programmes are paid within the recommended salary guidelines, said a ministry spokesman. The total manpower cost funded by the MSF is projected to be about $211 million in the 2018 financial year, which starts next month. This is up from about $194 million in the 2017 financial year. The increase in cost is due to the pay rise and other factors, such as plans to expand services. The heads of some charities told The Straits Times that the challenge is to raise more donations to match these salary increases, as not all their employees are in MSF-funded programmes. Ms Jenny Bong, group executive director of Methodist Welfare Services, said: "You can't raise the pay of a social worker working for an MSF-funded programme, but not another worker in a programme that is not funded. We have to give pay rises across the board." Plans are afoot to make it easier for the needy to seek and receive help from any front-line officer at a community or government agency, as part of the SG Cares national movement to foster a more caring society. These officers will be armed not only with knowledge of what their agency provides, but also a range of other aid schemes. This means different agencies will share information and better coordinate their services to ensure people get the help they need, Minister for Social and Family Development Desmond Lee said during the debate on his ministry's budget yesterday. "As far as possible, they should not need to submit the same documents, repeat their circumstances or fill in multiple application forms asking for similar information. "This will help reduce the burden often faced by low-income individuals who may be in distress or urgent need," he added. Two other ministries also told the House of their SG Cares efforts. The Ministry of Culture, Community and Youth (MCCY) is encouraging more people and companies to volunteer, said its minister Grace Fu, while the Health Ministry is building a network of volunteers to support seniors, announced Health Minister Gan Kim Yong. For example, the Government has brought various service groups together in pilot projects in Bedok and Jurong East to serve seniors. The collaboration allows the groups to identify the residents' needs and find ways to meet them. MCCY plans to replicate this model in other towns. Elaborating on how the Ministry of Social and Family Development will make it easier for people to apply for aid, Mr Lee gave the example of mothers or single parents who work or are seeking work and getting ComCare help. In such a case, the ministry will automatically assess their eligibility to get extra childcare subsidies and other financial aid when their child is enrolled at a childcare centre. They do not have to apply for such aid. Mr Lee told Dr Lily Neo (Jalan Besar GRC) and Parliamentary Secretary for Home Affairs Amrin Amin (Sembawang GRC) that coordination among different agencies will continue to be improved so that needy families, who face a host of complex problems, get help in a more holistic manner. The ministry is also looking at locating complementary services - such as family service centres, which provide counselling and other help, and Social Service Offices, which give government financial aid - in the same premises. Social workers interviewed say better coordination of help services prevents people from falling through the cracks and avoids the duplication of resources. A 51-year-old single mother who is partially blind and receives government aid had a teenage son who was suicidal. The boy was counselled by a social worker, who liaised with his school to keep tabs on him. Besides the social worker, staff from different agencies, ranging from Samaritans of Singapore to the grassroots, came together to lend the family a hand. The mother: "I didn't have to run around looking for help. They came together to find ways to help me. They let me know there was hope and help." Caregivers of people with autism or intellectual disability will get more support, including help to defray the cost of hiring a foreign domestic worker. From April 1, these caregivers will be able to apply for a discounted maid levy of $60, and depending on the support needed, possibly also a $120 monthly grant. Currently, such help is only for caregivers of people who cannot perform activities of daily living such as going to the toilet. "We estimate that about 1,000 persons with disabilities and their caregivers could benefit," said Ministry of Social and Family Development's (MSF) Senior Parliamentary Secretary Muhammad Faishal Ibrahim in Parliament yesterday. People with autism or intellectual disability will undergo an alternative evaluation to apply for the discounted levy and grant. Dr Faishal said this assessment will, in particular, help people with intellectual disabilities or autism spectrum disorder who need help performing activities of daily living. MSF has worked with the Ministry of Health to include MSF's Client Assessment Form as an alternative tool to evaluate the support a person needs to perform daily living activities, said Dr Faishal. He said people with disabilities and their caregivers can approach special education schools, or disability care services such as the day activity centres, to have the assessment done onsite. During the debate on MSF's budget, Dr Faishal also announced that a Caregivers' Space will be set up at the Enabling Village by this year. This will serve as a meeting place for peer support groups, a training space for caregivers of people with disabilities, and a venue for caregiver engagement sessions. "We want caregivers to come, learn from the experiences of fellow caregivers, and get advice and moral support as they walk their caregiving journey," he said. The Special Needs Trust Company, a non-profit firm that offers subsidised trust services, will step up efforts to raise awareness about its care planning and financial education services, he noted. It has already helped about 500 families. Over the next five years, the firm will try to reach out to more than 1,700 caregivers of persons with disabilities, he said. More pre-schools will offer Tamil and Malay language classes to help children build a strong foundation for bilingual learning. By 2022, about 350 pre-schools run by anchor operators will offer these classes, up from about 200 now. Such operators receive government grants in return for meeting certain quality criteria and not raising fees beyond a certain level. There will also be more Ministry of Education kindergartens that offer the three main mother tongue languages (MTL) - Malay, Tamil and Chinese. By 2023, there will be 50 of these kindergartens, up from the existing 18. The plans were announced yesterday by Dr Muhammad Faishal Ibrahim, Senior Parliamentary Secretary for Social and Family Development, and Education. "To support the sector's growth, we may need over 1,000 more MTL teachers by 2020," he said. Dr Faishal said anchor operators are working with the Early Childhood Development Agency (ECDA) to offer better career progression to attract more early childhood professionals, amid the growing demand for childcare services. Another 3,000 more early childhood professionals are needed by 2020, bringing the number to 20,000, he added. Dr Faishal noted that there is room for teachers to take on more senior roles, such as being mentors to junior teachers or school leaders managing a cluster of centres. Over the next five years, the anchor operators will create some 1,000 more senior positions, double the current figure. Meanwhile, salaries in the pre-school sector are set to rise. The median pay in the early childhood education sector has grown by about 15 per cent in the past three years, compared with a rise of about 8 per cent for jobs in general. As the sector continues to expand, ECDA expects salary growth for pre-school educators to continue to outpace general market trends. Educators interviewed said they welcome the move for more pre-schools to offer Tamil and Malay. Ms Nabilah Abdul Fitrey, 25, who teaches Malay at PCF Sparkletots in Bukit Batok, said the centre's Malay programme helps children build a strong foundation and helps them appreciate the Malay culture. Ms Yogeswari Raghavan, 40, executive principal of PCF Sparkletots in Sembawang and Admiralty, said many children do not often speak Tamil at home, but Sparkletots gives them a chance to do so. She said the children have grown in confidence and "become less afraid of speaking Tamil". Young couples keen on buying their first flat no longer need to push back their plans because of a lack of income history. Among a slew of measures to help young couples get their first home more quickly, the Housing Board is allowing a group of people aged at least 21 years, including undergraduates and national servicemen, to apply for grants to buy a flat earlier. This would shave off at least a year from their home-buying journey. The assessment of their income for housing loans and grants will be deferred to just before they collect the keys to their homes, instead of the time of application. This is typically about three to four years later, by which time the couple should have enough time to build their finances, National Development Minister Lawrence Wong said during the debate on his ministry's budget yesterday. Currently, at least one person must fulfil a minimum period of 12 months of continuous employment to qualify for a grant. While new flats are already highly subsidised, eligible buyers also stand to get up to $80,000 in additional grants. Mr Wong said some young couples may find themselves delaying their flat application for one or two years, then waiting for another four years for the flat to be ready. "I think that is too long a wait," he said. The new scheme will be rolled out at the next sales exercise in May. The move was welcomed by Ms Stefanie Mok, who is between jobs, and her boyfriend, accounting undergraduate Gerald Sim. The 24-year-olds have been dating for three years, and started talking about marriage last year. Prior to Mr Wong's announcement, the couple would not have been eligible to apply for a flat as Ms Mok had been working for only about seven months. Ms Mok said: "Couples like us can apply for a flat earlier so that will definitely save us some time waiting for the flat to be ready." While the idea will speed up the home-buying process, International Property Advisor's chief executive Ku Swee Yong cautioned that it may encourage young people to take more financial risks earlier. "How can they be said to have 'carefully considered' buying a flat if they have not started to earn their own keep?" he said. Besides the deferred income assessment, the HDB is also doubling the number of flats with shorter waiting times it will offer next year. Mr Wong said about 2,000 flats to be offered next year will have a waiting time of two to three years, compared with the usual three to four years. About 1,100 such flats will be launched in Sembawang, Sengkang and Yishun in the second half of the year. The minister also told Mr Gan Thiam Poh (Ang Mo Kio GRC) that his ministry is studying how to further reduce the waiting time, but cautioned that it is not possible to do it for all flats as some sites are not ready. Mr Wong, in response to a question by Ms Lee Bee Wah (Nee Soon GRC), said his ministry is studying how to "further streamline processes" to make buying an HDB flat quicker and easier, on top of the introduction of the Re-offer of Balance Flats sales launch last August. Among other things, the ministry is checking whether the balloting process for flats can be halved from six weeks to three, and he hoped he would be able to announce "some good news before too long". Divorcees will no longer have to wait three years before they can apply for a second subsidised flat, a move that took some MPs by surprise. With the change, each spouse in a divorce can buy a subsidised flat as long as they meet the qualifying requirements. Previously, former spouses could get only one subsidised flat between them. Divorcees with sole care and control of all their children under 18 years old could buy a subsidised flat without getting their former spouse's consent. But those who did not get sole care and control, or had no children, had to get their former spouse's consent if they wanted such a flat within three years. National Development Minister Lawrence Wong, in announcing the change yesterday, said: "We hope this will help divorced persons provide a more conducive living environment for their children, and go some way to help families through an already-difficult period of transition." The rules are being eased, as divorces have been rising over the years. For instance, there were 7,614 divorces and annulments in 2016, a rise from 6,904 in 2006. The debarment period was introduced in 1997 to reportedly prevent couples from "gaming the system" and owning multiple flats. Initially, it was for five years. In 2013, it was reduced to three years. When asked how to prevent couple from abusing the new situation, the ministry and HDB both told The Straits Times that the courts would have ensured there are valid grounds proving an irretrievable breakdown of a marriage before granting a divorce. A ministry spokesman added: "Each party will be required to abide by the prevailing policies and terms of their flat purchase. We will not hesitate to take stern action against the parties if there is a breach." Several MPs had asked during the debate on the ministry's budget that more help be given to divorcees. One of them was Mr Louis Ng (Nee Soon GRC), who later told The Straits Times he was "pleasantly surprised" with the announcement. 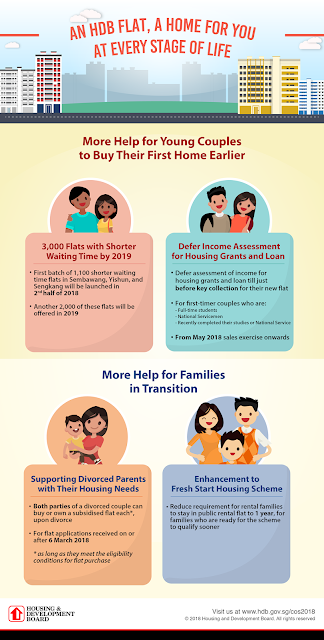 Another HDB change will shorten the wait for families who want to buy their second subsidised flat under the Fresh Start Scheme. To get a two-room flat with a shorter lease, they must have at least one child younger than 16 years of age and live in a public rental flat. The minimum stay in the rental flat will be halved to a year. Regular checks on the facade of older buildings will soon be introduced, with legislative changes due to take place by year end. The rules will apply to buildings that are more than 20 years old, and higher than 13m - about the height of three storeys. Under the proposed new rules, inspections will take place every seven years. There are now no requirements for building owners to inspect facades. "Building owners will be given about one year's lead time to prepare before the requirement comes into effect," Second Minister for National Development Desmond Lee said in Parliament yesterday. Mr Chong Kee Hiong (Bishan-Toa Payoh GRC) brought up recent incidents when cladding fell off buildings, and said that while there are now periodic structural inspections, these do not cover non-structural parts like exterior features. Industry players welcomed the changes but raised concerns about younger buildings not requiring inspection. Engineering consultancy Arup Singapore's principal facade engineering leader Michael Chin said the move has been a "long time coming". Such inspections, he said, could help prevent serious incidents, such as parts of a facade falling off. But he said newer buildings under 20 years old can also be at risk. "Some of these may have inherent defects at completion," said Mr Chin. The Building and Construction Authority and Housing Board have called for proposals to develop a drone inspection system to inspect building facades. People in Singapore are using less water daily, partly owing to last year's price increase. The drop is five litres per person, with each member of a household using 143 litres a day last year compared with 148 litres in 2016. It is a significant decrease because it already exceeds the Government's target of 147 litres by 2020. The daily saving is about 20 glasses of water, and when added up for 30 days, it is equivalent to the amount of water used to take three five-minute showers a month. The lower consumption is encouraging, Minister for the Environment and Water Resources Masagos Zulkifli said in Parliament yesterday, when replying to Mr Seah Kian Peng (Marine Parade GRC) during the debate on his ministry's budget. But Mr Masagos was quick to add that the drop is not solely due to the price rise, which is being implemented in two phases: last July and July this year. 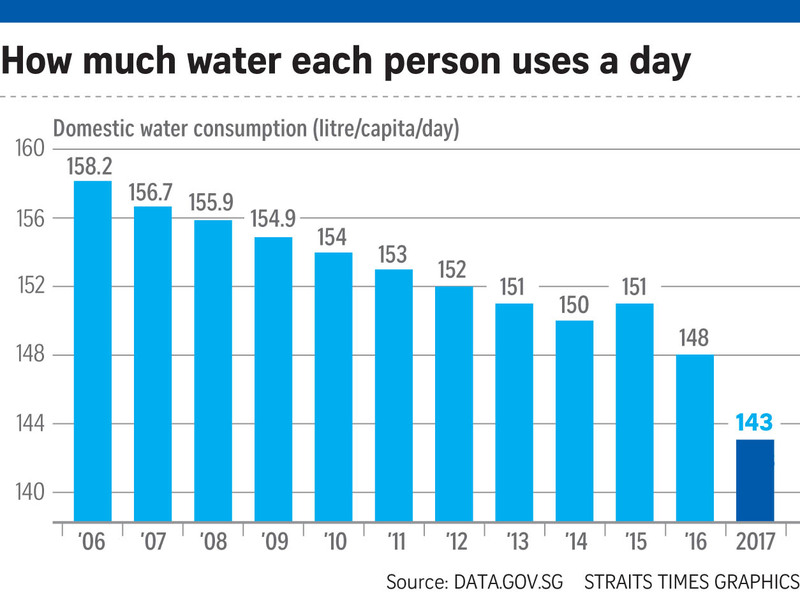 The hike, the first in 17 years, is to maintain Singapore's water infrastructure, pay for more costly water sources like desalination and help people recognise the value of water, the Government had said when announcing it last year. Yesterday, Mr Masagos also attributed the savings to "our water conservation efforts, like the mandatory water efficiency labelling scheme".The scheme, managed by national water agency PUB, requires suppliers to label water fixtures such as taps and toilet bowls with water efficiency ratings. Fixtures that are most water efficient get the maximum four ticks, and the least, one tick. The PUB also has a slew of water conservation programmes, Mr Masagos added. He cited a pilot scheme in 2016 that saw automated meters installed in 500 homes in Punggol to give families timely information on water consumption. It is linked to a mobile app that lets home owners track their use of water and get alerts when it is high. Mr Masagos said his ministry is looking at how to implement it across the country. Punggol resident Jacqueline Chan, 33, whose family took part in the pilot, saved about 8,000 litres of water after the app indicated a leak in their toilet. It was detected within a few days in October 2016, said Ms Chan, a receptionist who lives in a five-room flat with her estate manager husband Zell Chang, also 33, their one-year-old daughter and his elderly parents. If they had relied on manual readings, the leak would have been detected only two months later. The app also showed that the two main water guzzlers were the shower and washing machine. "Now, we each shower for 10 minutes instead of 15," she said. Overall, each family member uses, on average, 98 litres a day, compared with 103 litres last year and 138 litres in 2016. Their monthly water bill is now $10 less, Ms Chan said. Mr Masagos, in his parliamentary speech, also cautioned Singaporeans not to take running water for granted, citing the dire situation in Cape Town in South Africa, where water looks set to run out owing to a three-year drought. "What Cape Town experienced is not a remote possibility for Singapore. We must not wait for a crisis to take action," he said. There are no plans to introduce a levy on plastic bags, and replacing them with degradable or paper bags may not be greener, Dr Amy Khor, Senior Minister of State for the Environment and Water Resources, said yesterday. "Imposing a charge or ban on disposable plastic bags and substituting them with other types of disposable bags is unlikely to improve environmental outcomes," she said during the debate on her ministry's budget. 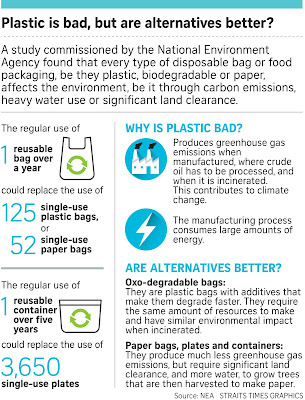 Every type of disposable bag, be it a degradable bag or a paper bag, affects the environment, be it through carbon emissions, heavy water use or significant land clearance, she said, citing a study commissioned by the National Environment Agency (NEA). Dr Khor was replying to a question from Ms Cheng Li Hui (Tampines GRC), who had asked if the ministry would consider imposing a levy on plastic bags to reduce their excessive use. The NEA study had looked at the environmental impact of disposables, including carrier bags. 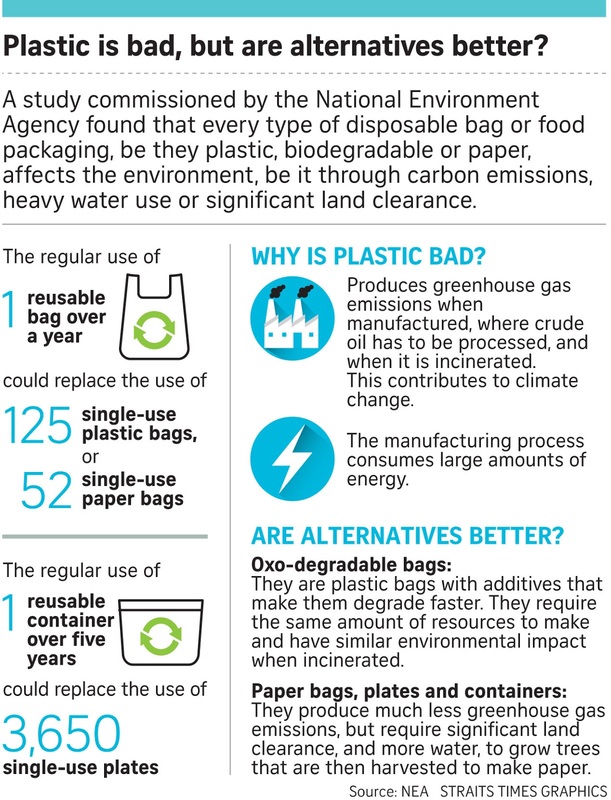 An estimate from the study is that the regular use of a reusable bag over a year could replace the use of 125 single-use plastic bags, or 52 single-use paper bags. Similarly, it also estimated that the regular use of one reusable container over five years could replace the use of 3,650 single-use plates. Some retailers in Singapore claim that degradable bags are greener alternatives to plastic bags and offer them instead. But the study, led by National University of Singapore scientist Kua Harn Wei, also found that both types of bags require the same amount of resources to make. Both are equally bad for the environment when incinerated. Noting that no levy on plastic bags is being planned, Dr Khor said these bags are necessary for the responsible and hygienic bagging of waste, given the country's moist, tropical climate. "In Singapore, a more sustainable approach is to tackle the excessive consumption of all types of disposables," she added, saying her ministry is working with stakeholders to minimise the use of plastic bags and disposables. She said, for example, that food delivery company Foodpanda is working on a trial where customers can opt out of disposable cutlery use when ordering food. Environmental group Zero Waste Singapore last year launched a campaign to encourage consumers to take reusable bags or containers with them to eateries and supermarkets in return for discounts or free gifts. On its part, the NEA will explore ways to reduce the use of disposables. Hawkers at new hawker centres managed by the NEA or by NEA-appointed managing agents - such as those in Our Tampines Hub and Yishun Park - have already been prohibited from providing disposables to patrons who dine in. In line with Singapore's Zero Waste vision, Dr Khor outlined plans to reduce packaging waste. Last year, Singapore produced about 557,000 tonnes of packaging waste - a third of domestic waste and enough to fill more than 1,000 Olympic-size swimming pools. Dr Khor noted that the voluntary Singapore Packaging Agreement has cumulatively reduced almost 39,000 tonnes of packaging waste since its inception in 2007. More will be done to reduce packaging waste at source, she said. "By 2021, we will mandate that businesses report on the type and amount of packaging they put on the market and their plans for reduction." How to get more people to return their trays at food centres? The answer may simply be: put up more reminders. 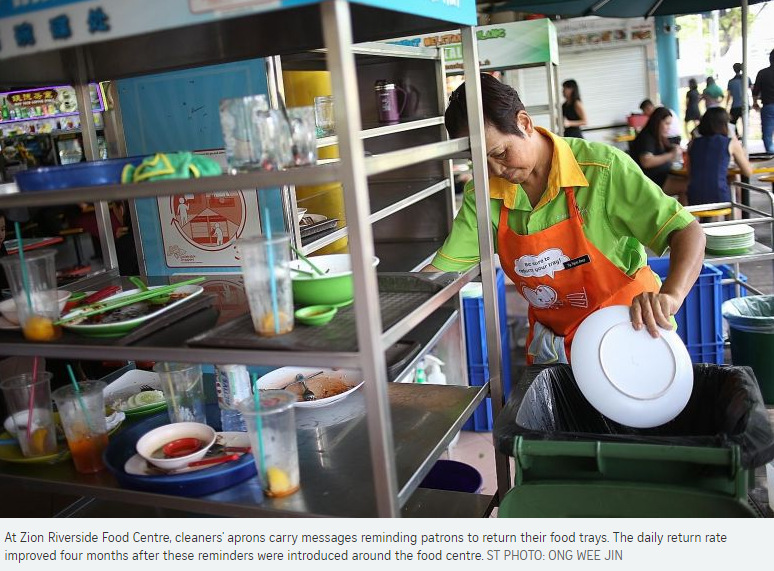 At two hawker centres, reminders to return food trays - emblazoned on banners, tables and even aprons worn by cleaners - have had good results, said Senior Minister of State for the Environment and Water Resources Amy Khor yesterday. At Zion Riverside Food Centre, four months after these reminders were introduced in March last year, more patrons returned their trays and dirty cutlery to designated tray-return stations. From a daily average of five in 10, the return rate went up to seven in 10, based on an assessment last year by the Ministry of the Environment and Water Resources. The rate of tray return has also improved at Adam Food Centre in Adam Road, going from 9 per cent in July last year to 51 per cent in November, after reminders were emblazoned on banners and the T-shirts of cleaners, and made through audio announcements. Dr Khor said her ministry plans to introduce such behavioural cues at more hawker centres, starting with Marsiling Mall and Bukit Merah Central food centres. She said that inculcating a tray-return habit can ease the work of cleaners, allow for faster turnover of tables and improve hygiene. A common misconception is that encouraging people to return their trays may deprive cleaners of their jobs, said Dr Khor, but this was not the case. "Cleaning companies cannot hire enough cleaners, and existing cleaners have difficulty coping with clearing crockery and cleaning the tables, particularly during peak hours," she said. Mr Peter Tan, 57, chairman of the hawkers' association at Zion Riverside Food Centre opposite Great World City, said that hawkers and cleaners would even personally remind patrons to return their trays. It has become easier to find clean, empty tables, said administrator Veronica Mah, 60, who eats at the centre daily. "It makes it easier for the next person," she added. Singapore is setting up its first cyber-security start-up incubation hub, with funding to be provided for new inventions, as the country strives to carve out a role for itself in the new digital economy. Dubbed Innovation Cybersecurity Ecosystem @Block 71 (ICE71), the hub will open its doors to cyber-security entrepreneurs next month. It will be located in a cluster of industrial buildings in Ayer Rajah Crescent known affectionately and collectively as "Block 71". The area is currently home to about 700 technology start-ups. The aim is to hand-hold aspiring entrepreneurs to ensure their business ideas are sound, and to ensure they have the necessary financial and business know-how to take their ideas to the next step. Help will also be given for expansion to overseas markets and access to venture funding. The Infocomm Media Development Authority (IMDA) and Singapore's Cyber Security Agency (CSA) are working with Singtel and the National University of Singapore (NUS) to launch ICE71. The hub will be located within the existing premises of Singtel's corporate venture arm Innov8 and NUS Enterprise at Block 71, and seeks to groom up to 100 entrepreneurs and 40 start-ups over the next two years. Minister for Communications and Information Yaacob Ibrahim announced these moves during the debate on his ministry's budget yesterday. "A vibrant cyber-security ecosystem is an important factor contributing to robust national cyber security," said Dr Yaacob, agreeing with Mr Zaqy Mohamad (Chua Chu Kang GRC) and addressing a point made by Ms Sun Xueling (Pasir Ris-Punggol GRC) that Singapore's connectedness exposes it to attacks. Separately, CSA will also roll out a new funding scheme to spur developments that would meet national security needs, believing that innovation is the key to stay ahead in the arms race against cyber attackers. The areas of focus include forensics, authentication, the Internet of Things and managed security services. Funding of up to $500,000 will be provided to qualifying projects by Singapore-registered companies. At least 50 per cent of the manpower employed in the project must be Singaporeans or Singapore permanent residents. The aim is to develop home-grown companies that could own a slice of the lucrative cyber-security market, tipped to attract spending of US$105 billion (S$138 billion) by 2020, according to global estimates by market research firm IDC. Singapore's cyber-security market could generate $900 million in revenue by 2020, said Dr Yaacob. "Cyber security is also a growth engine," he said, acknowledging Mr Cedric Foo's (Pioneer) point that technology talent is needed to propel Singapore's economic expansion in the digital realm. To prepare the workforce, IMDA will invest an additional $145 million in its technology skills development and job placement initiative, dubbed TechSkills Accelerator (Tesa), over the next three years. This will create 20,000 training places by 2020, with a focus on company-led courses and emerging areas such as cyber security, data analytics, artificial intelligence (AI) and the Internet of Things. Since its inception in April 2016, Tesa has trained 27,000 professionals in new technology skills to prepare them for the digital economy. Some $120 million has been spent to date. To Dr Teo Ho Pin's (Bukit Panjang) question on regulations to ensure accountability for new developments such as AI, Dr Yaacob said: "Currently, we have no plans to introduce regulations for AI applications as the field is still nascent and (we want) to avoid stifling innovation." The Ministry of Communications and Information will also be deferring the review of the Broadcasting Act to study in detail how digital technologies and social media platforms have come together to increase the risk of fake news, Dr Yaacob said in his reply to Mr Ong Teng Koon's (Marsiling-Yew Tee GRC) question on the challenges brought about by such convergence. Dr Yaacob added: "As Parliament has just appointed the Select Committee on Deliberate Online Falsehoods to examine the issue, it would be better to study the Select Committee's recommendations first before making further moves." The National Library Board (NLB) will be doing more to prepare Singaporeans for a future where digital skills are in high demand. SkillsFuture@Libraries will be rolled out to help people make well-informed choices regarding training and careers, look for career opportunities, and be more innovative. NLB is working on this with various partners, namely SkillsFuture Singapore, Workforce Singapore and the Council for Third Age as well as the Infocomm Media Development Authority (IMDA). The board will also introduce a re-employability series for senior citizens at various stages of their careers, comprising talks and workshops on how to use tech tools, digital resources and online services. The aim is to reach out to more than 5,000 seniors at public libraries over the year, from the third quarter of this year. There will also be collaborations with tech companies in events such as the NLB-Microsoft Artificial Intelligence Hackathon and the National Digital Storytelling Competition, both of which will be open to students, said Dr Yaacob Ibrahim, Minister for Communications and Information said in Parliament yesterday. NLB will also partner with IMDA to extend the reach of digital training to more than 300,000 Singaporeans over five years - 85 per cent of whom are expected to be adults. "This year, seniors can look forward to TechShare, a tech showcase platform for seniors to try current and upcoming technology in a 'tech playground' setting, exploring gadgets such as robots and smart home technologies," Dr Yaacob said. Investment firm Temasek Holdings can be expected to query portfolio companies at shareholder meetings if it spots irregularities in the accounts, said Senior Minister of State for Finance and Law Indranee Rajah yesterday. She told Parliament: "Does the Ministry of Finance (MOF) expect Temasek, when it sees something suspicious in audited accounts, to raise it at shareholders' meetings? The answer is yes." The comments were in response to queries from Ms Sylvia Lim (Aljunied GRC), who had asked if Temasek queries suspicious practices in the companies that it invests in. Her question comes as Keppel Corporation's offshore and marine unit was fined US$422.2 million (S$557 million) last December over bribes paid by a former agent to secure contracts in Brazil. Ms Indranee added that the Government also expects Temasek to uphold the highest standard of integrity and corporate governance - a standard that, in turn, is expected from Temasek's investee companies. The Government is the sole shareholder of Temasek. Ms Indranee also outlined three areas where Temasek plays the role of an advocate for good corporate practices. One is by fostering an ethos of integrity, good governance and sustainability. Ms Indranee referred to remarks made by Temasek chairman Lim Boon Heng when he was addressing the chairmen of Temasek-linked companies on Feb 27. Mr Lim told them: "In markets where practices are questionable and compromising integrity is required to win business or contracts, we have to be very clear - there is a bright red line our companies should not cross." Temasek also monitors the strategy and performance of its portfolio companies, Ms Indranee said, adding that it conducts regular roundtables on topics of interest to these companies as well. She also noted that the Government aims to reduce its rate of late payment to business vendors to below 5 per cent on average, down from 6.5 per cent now. She added that the Government processes an average of two million payments to more than 23,000 companies a year. Since the start of this year, all businesses that transact with the Government have needed to submit payment details only once. The Accounting and Corporate Regulatory Authority of Singapore is simplifying the filing of annual returns for exempt private companies and certain dormant companies as well. This will potentially benefit 150,000 companies, said Ms Indranee. Government processes for budgeting and ensuring taxpayers get value for money are becoming more rigorous, said Second Minister for Finance Lawrence Wong. He noted in Parliament yesterday that there is the block budget framework which sets a spending limit for ministries. Another facility - the budget utilisation framework - encourages ministries to budget as closely as possible to expenditure needs. Large infrastructure projects have the gateway process, a multi-stage system that scrutinises the requirements, the scope and design of the projects at key milestones before funding approval is given. The Finance Ministry also works with agencies to conduct value-for-money reviews to assess if programmes are attaining intended outcomes in a cost-effective manner. Mr Wong said: "Achieving value for money goes beyond cutting costs; it is also about creating greater value, while we carefully manage the costs." The Government will consider how each large infrastructure project affects others and assess the potential synergies of multiple developments. For example, the Land Transport Authority's innovative 4-in-1 depot saved the Government $2 billion. Another example is the integration of PUB's Tuas Water Reclamation Plant with National Environment Agency's Integrated Waste Management Facility. Mr Wong said the Government is placing greater emphasis on ensuring value for money over the lifecycle of the infrastructure projects. All of the unexpected budget surplus from the financial year of 2017 has been shared with Singaporeans in various ways, said Second Minister for Finance Lawrence Wong who urged the SG bonus to not be viewed “in isolation”. As announced in the Budget statement, Singapore is expected to see an overall budget surplus of S$9.61 billion for the year ending Mar 31. This is more than five times above the S$1.91 billion official estimate, thanks largely to exceptional statutory board contributions and higher stamp duty collections. The entire additional S$7.7 billion above the official estimate is being given back to Singaporeans in various ways, instead of just the S$700 million SG bonus, Mr Wong stressed, as he addressed Nominated Member of Parliament (NMP) Azmoon Ahmad’s suggestion for the Government to share more of the unexpected budget surplus. “We don’t save surpluses. We give them all back to Singaporeans but we give back in different forms,” said Mr Wong in Parliament on Tuesday (Mar 6) during the debate on his ministry’s budget. “Some will be for spending (on) future needs. Some will be spending for current needs… and some will be through a direct transfer, like the SG bonus,” he added, urging for the surplus to be viewed "in totality". Mr Wong cited the setting aside of S$5 billion for a Rail Infrastructure Fund “which will benefit all MRT commuters”, and S$2 billion for premium subsidies and other forms of support when the ElderShield review is complete. “These premium subsidies for lower- and middle-income Singaporeans will ensure that the enhanced ElderShield scheme remains affordable and the premium subsidies will directly benefit these individuals and their families." As such, the SG bonus, which distributes up to S$300 each for all Singaporeans aged 21 and above this year, should not be viewed “in isolation". Mr Wong also raised the example of other existing social transfers, such as the GST Voucher, U-Save Rebate and Service and Conservancy Charges (S&CC) Rebate. Over the years, the Government has also enhanced its permanent schemes in various areas, such as housing and healthcare, with more assistance targeted at the lower-income group. “The support we provide to Singaporeans who need help goes beyond the SG Bonus and these direct transfers schemes,” he said. In his speech, Mr Wong also touched on the Government’s overall funding approach and stressed that even as it considers borrowing for certain major infrastructure projects, it will “do so prudently and on a selective basis”. This means that it will “borrow for the right projects”, namely those that generate adequate future revenue streams to repay the borrowing, said Mr Wong. One example would be the Changi Airport Terminal 5, he added. Therefore, there will still be capital projects the Government will continue to fund through development expenditure from the annual budget, said Mr Wong. For FY2018, the share of development expenditure is “slightly higher” at around 28 per cent of the total budget, the minister added. Moving forward, development expenditures will rise amid continued investment in infrastructure and other capital projects. In the meantime, operating expenditures are also poised to increase on the back of spending in areas like healthcare and security. “We will continue to monitor this share between operating and development spending. It’s an important balance… and it’s critical we get the balance right,” said Mr Wong.